Amazon announced earnings for Q4 2015 recently At the close of the market, with Amazon's showing EPS of $1 and revenue of $35.7 billion both came in below analyst estimates. Net sales from Amazon Web Services came in at $2.4 billion, up from $1.4 billion the previous year, and the company reported a 51% growth in prime users. while early this year there were rumors about GoPro making a quadcopter drone, but few details have since been shared about the project. However today that was confirmed as GoPro had just uploaded the first footage from the drone to its YouTube channel .GoPro ( former Woodman Labs, Inc), is an American manufacturer of action cameras, often used in extreme-action videography. The quadcopter drone "video grab were remarkably smooth, and the video also claims that the footage was not stabilized in post, but this could just be a result of careful filming. In about 13 months since GoPro’s IPO , it is currently trading at around $60 per share (up 150 percent from its IPO price of $24) and reported another great quarter this week, with the company posting a $35 million profit on revenue of $420 million. 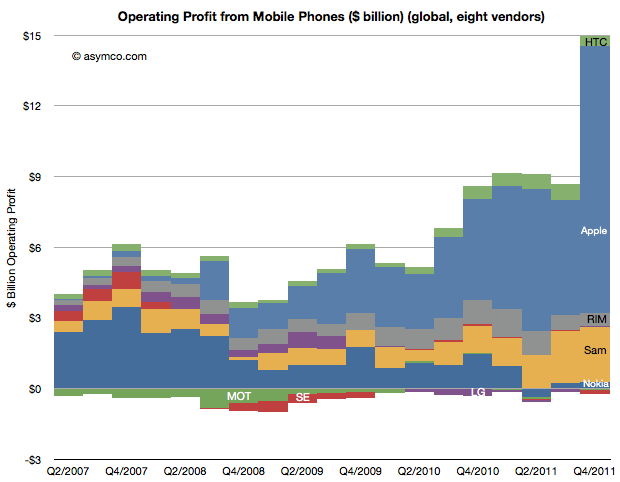 The Ipad continues to bleed as the IPhone continue to ride on unprecedented growth. 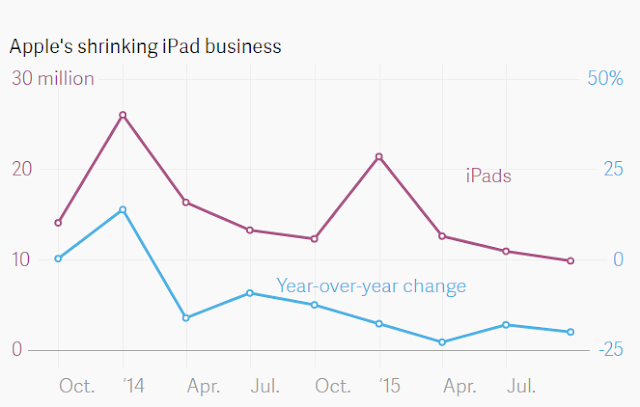 From a peak of 25 million Ipads in December 2014. Ipad shipments has slumped to 9.9 million last quarter, down 20% year-over-year. 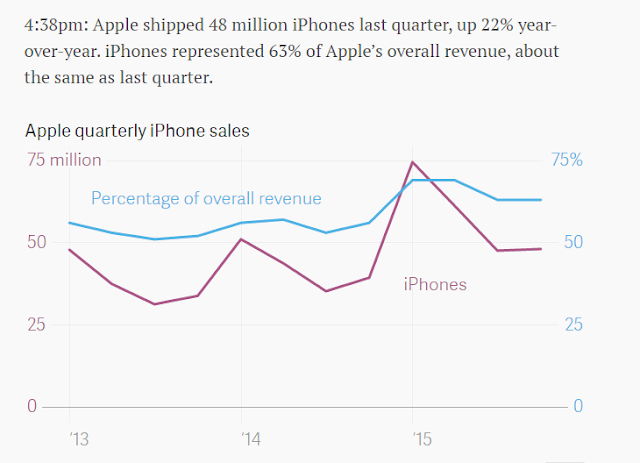 However it still managed to do about $4.3 billion this quarter , but whats disappointing, is that this was the first time that Apple shipped fewer than 10 million iPad's in a quarter since the June 2011 quarter. 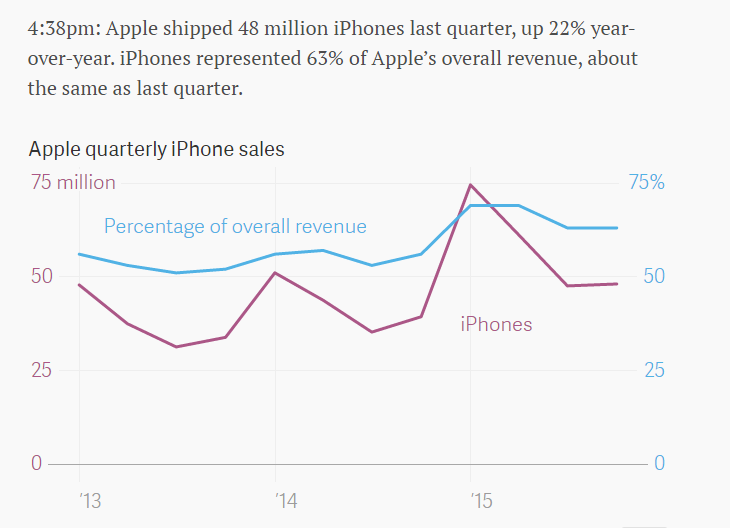 The biggest growth for Apple came from China, as sales grew 99% year-over-year,mainly due to the early launch of the iPhone there this year. 2 years after going public Twitter continues to bleed and loose money. It lost $162 million despite bringing in $436 million in revenue. Since its IPO in late 2013, it has lost a cumulative $1.25 billion over six quarters. 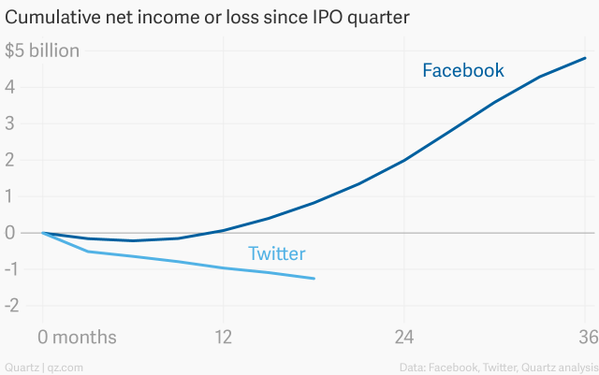 Facebook too went through the same phase and did not make profit it the first few quarters .however 6 quarters into its IPO ,Facebook generated almost $1 billion in cumulative profit. Now, some three years after going public, it has made almost $5 billion. The Above chart shows how charts to run in advance of earnings. 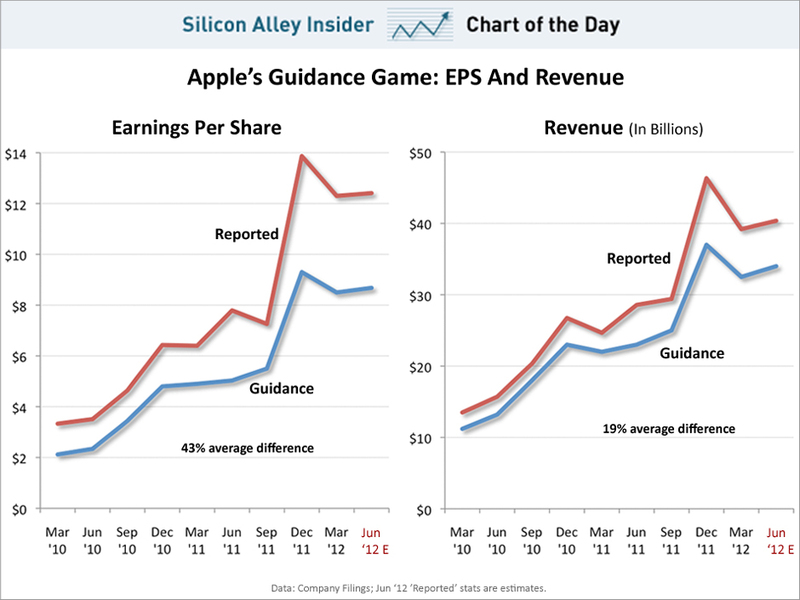 It's a look at how Apple always beats its earnings guidance, quarter after quarter. On average, revenue is 19% above its guidance. 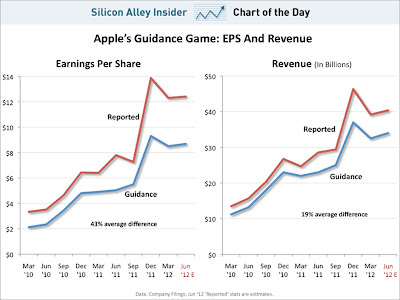 EPS is 43% above guidance. 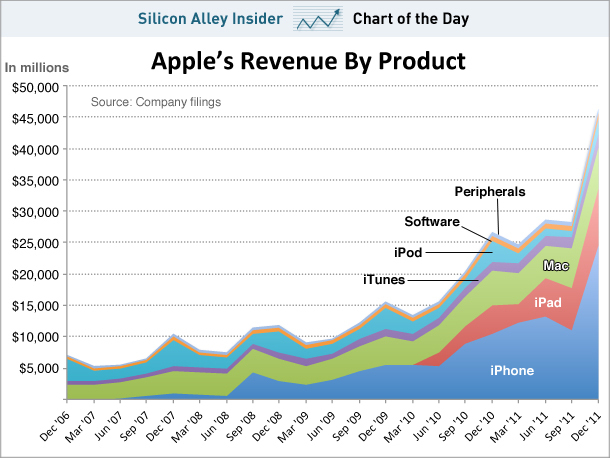 Therefore, we anticipate Apple will report revenue of $40.37 billion and EPS of $12.41. Wall Street analysts are expecting $37.23 billion in revenue and EPS of $10.35. 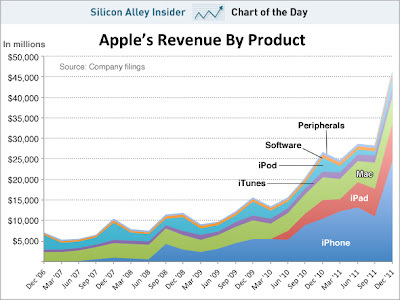 In Q1,2012, a chart showing the breakdown of Apple's sales by product category shows that its an iPhone company now, with 53% of sales coming from the smartphone.